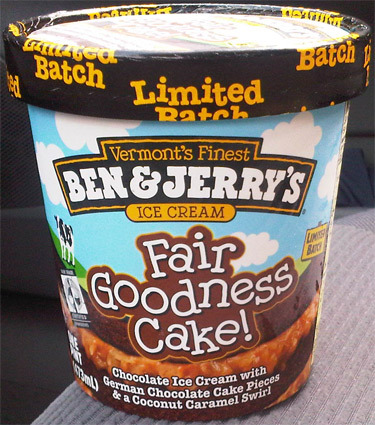 Ben & Jerry's Fair Goodness Cake! New for 2011 : Ok, I know it's not Breyers or Blue Bunny, but let me explain. I was feeling a bit of bloggers guilt about the selection on recent reviews... plus I wanted to go see this thing that some people call "the sun", so I headed over to the nearest Shaws to see what I could review for you guys. Problem is, the nearest Shaws still isn't stocking the mini blue bunny cups. Flustered, I headed out back out of the store and after a moment of debate, headed over to Stop & Shop. I wandered through and saw nothing new, but just as I was about to give up, what do I see? Fair Goodness Cake! It was hiding in a separate freezer with some sale items! I have been looking for this stuff but this is the very first time I've seen it. The description is "Chocolate Ice Cream with German Chocolate Cake Pieces & a Coconut Caramel Swirl". Wait, what? coconut? Oh, I was afraid they were going to say coconut.... and it's $4.79. Grrr, well, I can't leave empty handed. Now, have I mentioned I despise coconut? Like, with a deep seated, life long passion, yet, here I sit with ooey gooey puddles of coconut caramel swirl. And it's not just coconut flavor, you can actually see the coconut shreds inside the caramel. Oy, the things I do for this blog. Oh the coconut! So strong, but it's buried inside a very sweet sauce, and this chocolate, OOOOOO the chocolate, so rich, so tasty! I am annoyed by the coconut yet strangely drawn to this wonderful flavor combo. It's just so potent! Again, I hate coconut, but man, the sauce is just so sweet, and the chocolate is exquisite. Somebody get me a thesaurus stat! I'm not even sure I can separate the caramel flavor since the coconut and chocolate are popping out so much, but it does bind it all together in a way even I am having trouble putting down. Now I know it's not the best shot, but I need to show you the cake bits. They are rich, dark-colored chocolate bits with a coconut filled orange/brown filling (or layer). That blurry white spot in the middle is a bit of coconut. The cake bits are tasty and fairly frequent. It's hard to admit, especially considering I wasn't that hungry to start, but more than not, I enjoyed this flavor. It's just so powerful and unexpected. I polished off at least a third of it before I managed to cap the lid and force myself back to work. Verdict? a coconut flavor I enjoyed? now that's impressive! Buy Again? you never know! A quick story if you have time: When we got to make ice cream with the flavor gurus, they set out a bunch of ingredients for us. Accidentally, they set out some coconut caramel instead of the regular caramel. Now they said it out loud, but no one noticed (mainly because there was only one other hard-core Ben & Jerry's fanatic there). I said to my guru "you guys don't make a flavor with coconut caramel". No, no they do not, until now anyway. I was having a lot of fun so I said I wouldn't tell, and I never did, promise kept. Mmmmm Cake inspired ice cream! Sounds delish! I haven't seen this anywhere though :/ Anyway let me just sugest next time you DO want to try a blue bunny flavor PLEASE try out the Red Velvet cake... So amazing I can't even explain. Im so jealous of all the tasty flavours of ben n jerrys you get to try, i think i may need to launch a petition here in the UK. 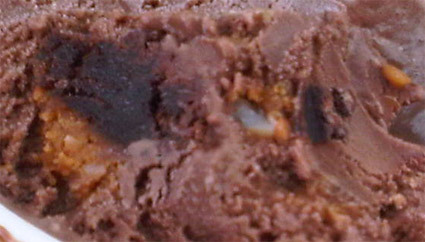 I love the look of the cake pieces in this one but im not a huge fan of chocolate ice cream. Random question, but when you eat Pint's of B&J, how much do you usually eat at one time? I know it's super premium, but I have a hard time spending that much money on them, especially when my family breezes through ice cream like whoa. I have mixed feelings about coconut. There were combinations containing coconut that I enjoyed and others that I hated. 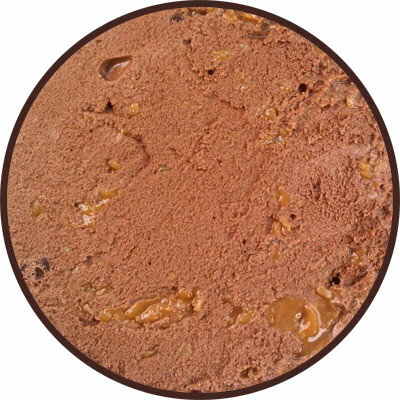 I didn't like the Nirvana Chocolate & Coconut ice-cream that I tried last year... and I usually love Nirvana ice-cream. Your ice-cream sounds more interesting because it has the cake pieces and the caramel. It would be nice if I could find it - it's not easy getting Ben & Jerry's halfway around the world... I only know a couple of shops that store it. Surprised you were able to get over the coconut. I only had a test spoon at a scoop shop but did pick up on the coconut a bit. I'm generally not a fan of BJs chocolate base, did you think this one was a bit different than the others? @Anon: this is a rare one! @Adam: 3 servings is pretty average for me on a pint actually, though I was impressed I made it past 3 spoonfuls on this one! @Ana: did I mention I hate coconut? @Rodzilla: maybe I'm crazy, but the chocolate really pops on this one. This one sounds really good! Are there any parially hydrogenated oils, high fructose corn syrup or corn syrup in this flavor? Found Fair Goodness Cake ice cream on the last day in a shopping mall! This is the second best thing I have ever tasted. Anybody who loves German chocolate anything will love this. The only thing missing are the pecans, but I can add those myself. Now I have to call my grocery store and make a request!! Found some today at a Giant in Baltimore. I absolutely LOVED this flavour. I'm a coconut lover, as well as an icecream fanatic, so this was just perfect. Soooo disappointed that it's limited :/ I was hoping it would be a permanent edition to the B&J's family! Finally found this flavor and it's one of the best B&J flavor's ever! Love coconut and the rich cake taste really makes this chocolate base amazing...Addicting! sorry, this one is long gone.... hopefully some day they will bring it back. have you tried chocolate therapy?